"It's a hit, It's a hit, standing up, the whole bit"
This is one of the funniest versions of the long-running revue we've ever seen. Another thing that Forbidden Broadway has in its favor is its electric cast. Alessandrini and his behind-the-scenes colleagues have an extraordinary track record for hiring wildly talented people -- including such formidable talents as Brad Oscar, Bryan Batt, Felicia Finley, Christine Pedi, and Ron Bohmer -- but rarely are all four performers in the same show as gifted as the quartet who take the stage in the current edition. Jared Bradshaw is dead-on and hilarious as a lead-footed David Hyde Pierce. The 25th anniversary edition is a charm... which might just be the best version yet...the show scores the most points when it goes for the jugular and lampoons specific actors or numbers�Jared Bradshaw's dig at David Hyde Pierce in the Curtains spoof "Slow People" is a clever and catty gem...a tour de force Spring Awakening spoof involving a hand-held microphone erection. "Go see the new Forbidden Broadway. It's great. "Forbidden Broadway has always been cast with strong singers who excel at farcical comedy and this crop is no exception. Jared Bradshaw is very funny as David Hyde Pierce struggling to execute the most basic dance steps and as an especially cruel Bob Martin, whose Man In Chair tells us all about how disenchanted he is with Beth Leavel's performance. The evening is slam-bang swift. 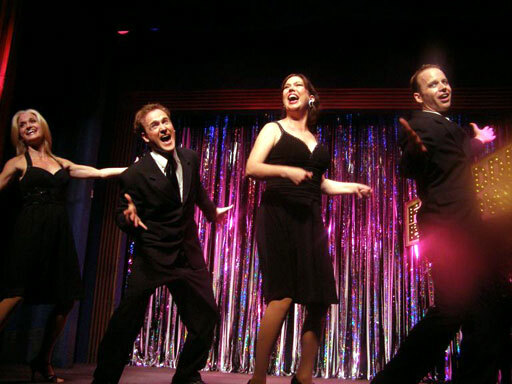 The cast - Dickinson, Valerie Fagan, Jared Bradshaw and James Donegan - upholds the show's impeccable standards for imitation, which is clearly not always a form of flattery. These are leather-lunged, quick-change chameleons. Are there really just four of them? Seems like 30. "Rude Awakening," the 90-minute revue features new and old sketches (a roughly 80%-20% split) and four insanely talented and versatile actors. Jared Bradshaw drolly echoes David Hyde Pierce in a "Curtains" number about fuddy-duddy fans, and his later turn as John Travolta, in blimped-out "Hairspray" drag, had me rolling. The evening's most intriguing moment, though, comes during a take on Spamalot's "The Song That Goes Like This." It doesn't take long to realize that Jared Bradshaw is singing the actual lyric -- and why shouldn't he? Alessandrini appropriately notes that it seems the self-aware ballad has been misappropriated from Forbidden Broadway. What's left for Alessandrini and his prodigiously gifted roster of performers? Pray for a Spring Awakening. The show's 25th anniversary edition, drolly titled "Rude Awakening," still packs plenty of bite in its far-from-benevolent spoofery, delivered as always by a cast of four performers as tireless as they are versatile. David Hyde Pierce also cops it, courtesy of Jared Bradshaw, with "Slow People," a clever riff on a number from "Curtains" that takes aim at undiscriminating audiences happy to applaud any face familiar from TV. The big little musical is back �and it's funnier than ever. Like past casts, the current quartet is beyond terrific. The cast of two men and two women is, as usual, perfect. These rubber faced acrobats can become David Hyde Pierce (in a very funny number about how s-l-o-w-l-y TV actors sing and move on stage) one minute and an over-emoting Raul Esparza (making like Chopin over Chopsticks in a Company spoof) the next. Believe me, it�s still the most fun you�ll have on or off Broadway. The laughs come at breakneck speed � at 90 minutes (including a five-minute intermission! ), the jokes fly by so fast you'll wish you could hit rewind. Performers Jared Bradshaw, Janet Dickinson, James Donegan and Valerie Fagan are immensely talented and uniquely hilarious. They're all gifted mimics, but their voices can also raise the rafters. Backstopped by unflappable Steve Saari at the piano, Jared Bradshaw, Janet Dickinson, James Donegan and Valerie Fagan are the fast-morphing foursome making mockery of the Broadway scene. 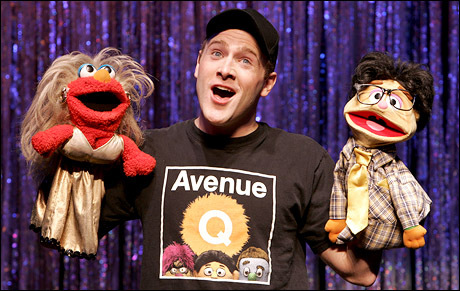 Another fabulous voice recently heard was Jared Bradshaw in the latest edition of "Forbidden Broadway: Rude Awakening". The range this Georgia-born baritone displayed in the hilarious takes on "Spring Awakening," "Curtains," "Company," and, be-shorted and on roller skates, in "Xanadu," was really impressive, making him just the latest in this show's long line of awesomely versatile talents, including Christine Pedi and Michael McGrath. The first act quickly improves, however, with a withering take on Curtains (Jared Bradshaw's David Hyde Pierce sings of slow people,i.e. the audience). 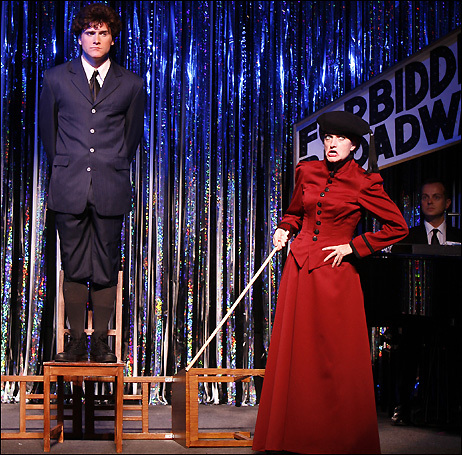 This Forbidden Broadway is fast-paced, sharp, and smart. Which is more than can be said for most of the shows it skewers. The show, as always, is wickedly clever from the start: if you follow Broadway, you�ll be laughing and nodding non-stop. The four actors work like Trojans (in the old-world sense of that word) and only get a five-minute intermission to relax. Besides, this quartet of worthies � Jared Bradshaw, Janet Dickinson, James Donegan and Valerie Fagan--- are astonishing performers. Bradshaw is perfect with the ever-so-dazed look that Bob Martin brought to Man in Chair. In the Les Miz section that spoofs the ever-spinning turntable, the way that Bradshaw speeds around in circles, you�d swear there really was one on stage. How nice, too, to be with an audience that gets the inside jokes � and I wasn�t even at a critics� performance. there is constant movement, an invigorating momentum and a plenty of witty musical ditties. First class impersonating, singing, and comical prowess make this edition one not to miss. The laughs generated by the performers and their written material celebrate the satirical revue�s 25th anniversary with this latest and possibly best edition. the energized cast hits its mark and has the audience in its grips through each fast-paced costume change, rewritten song, and star impersonation. Jared Bradshaw is remarkable hitting notes only dogs can hear as he channels Colm Wilkinson of "Les Mis" fame singing "God It's High." But it's his impersonations of newcomer Jonathan Goff in "Rude Awakening," and David Hyde Pierce in "Slow People," that keeps the material delicious and true. 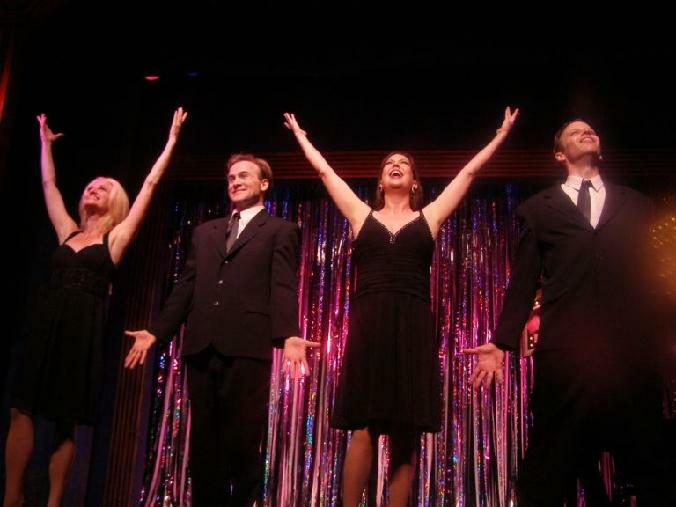 It is amazing how fresh the �Forbidden Broadway� show can manage to be as it celebrates its 25th anniversary with its latest edition, subtitled �Rude Awakening.� It is up to date, enormous fun, and blessed with terrific performers who are skilled at plunging into the variety of songs and sketches demanded of them. There is nothing tired about this show! Jared Bradshaw and James Donegan are brilliant handling the variety of male performing. 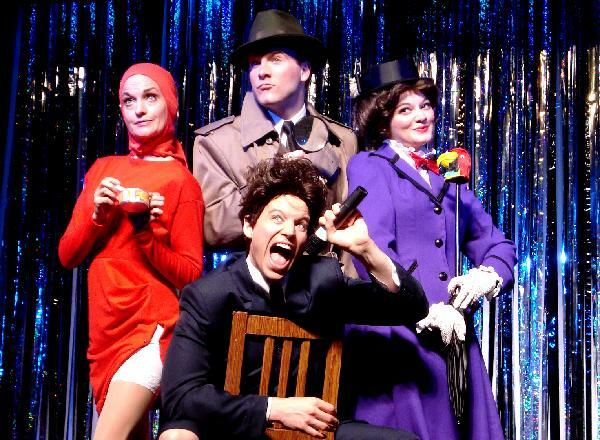 There�s nothing better than Forbidden Broadway pistol-whipping the theater. Jersey Boys fast becomes �Jersey Goys� as two terrific men in the show, Jared Bradshaw and James Donegan, help Fagan sing a rewritten lyric to �Sherry� (�Scary Broadway�) long enough so that it sounds like a lullaby you�d hear in a morgue. Gerard Alessandrini's latest edition, �Rude Awakening,� offers moments as salty and savage as anything he has written. Forbidden Broadway does Spring Awakening ! The cast ! Janet, Jared, Val, David, James! The cast at curtain call. Wendla, Melchior, and Mortiz do Spring Awakening ! Lotte Lenya censors another German musical: Spring Awakening !